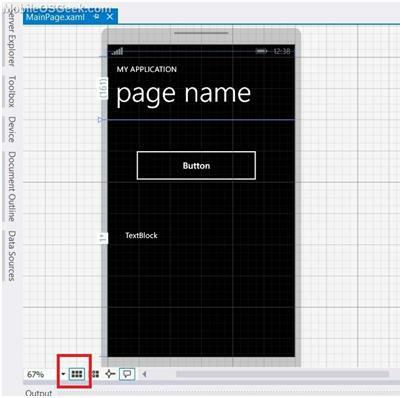 You can easily align the content as well as the spacing between the elements when developing the Windows Phone apps in Visual Studio 2012 . The feature called “Alignment Grid” which was available in Expression Blend and is now available in Visual Studio 2012 . The Alignment Grid feature is very useful for setting the alignments of the elements of your Windows Phone page easily. To enable the Grid Alignment , just click the button at the bottom of the designer . This will show a 12px alignment grid in Visual Studio which helps the developers to align the UI elements accordingly.